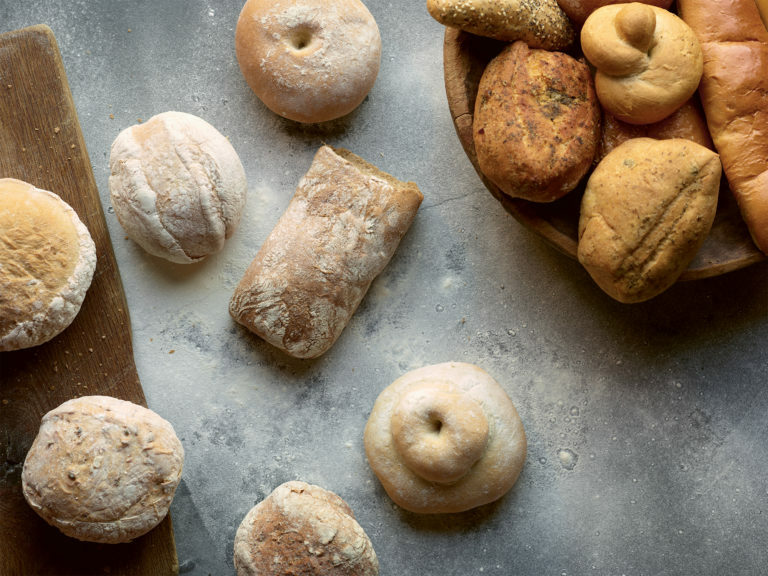 From hand stretched ciabatta to the traditional Kentish favourite the huffkin, we bake a fantastic array of rolls suitable for any occasion. Our brioche and ciabatta are also approved by the Craft Guild of Chefs, giving you an extra level of confidence in the quality of our breads. Perfect for those times when a full-size baguette isn't practical, our crispy-crusted quick bake demi baguette has a lovely, soft, typically French interior. Plant based diets are increasing in popularity and we have developed a unique vegan bun. Our recipe includes a touch of potato to create a light eat. A quality bun to be enjoyed by all. Light, rustic and hand-finished, these baguettes are reminiscent of the very best in France. Perfect for sandwiches, bread baskets or anywhere else that you would use a great quality traditional baguette. The ultimate southern BBQ style rustic burger bun with a dash of red malt in the dough. They have an authentic wrinkled top to make them stand out from the sea of “perfect” buns out there. The ultimate southern BBQ style rustic burger bun with a dash of red malt in the dough. Exactly the same recipe as our Alabama Grillhouse Bun but with the addition of poppy and sesame seeds give them an extra nutty flavour. Multigrain sub loaves made with malted wheat for a rich flavour. Ideal for sandwich bars & takeaways. Approx 23” long for cutting and toasting. These rolls look fantastic with a really farmhouse rustic appearance and are absolutely packed with flavour. Each roll is made with a multigrain flour as well as chia and poppy seeds, which makes for a superb flavoursome eat. Chia seeds are well known for their apparent health benefits and are a particularly good source of Omega 3. A malted version of our popular cross between a ciabatta & panini roll. Gives a lovely malted flavour that compliments a variety of fillings. Our ciapaninis are equally as gorgeous simply thawed and filled. Alternatively add your favourite fillings and grill for a lighter panini style sandwich. A flavoursome, oven-baked Italian bread with a big heart, simply made with water, strong flour, salt, yeast and a generous dash of fragrant extra virgin rapeseed oil. Serve it on the side or stuffed with glorious delicacies like sausage burgers, or team it with tagines, polenta chips or poached chicken fillets. Hand-shaped to perfection with a rustic floured finish and cranberries for extra zing, tangy and sweet. Far too good to reserve for Christmas, so we’re making it all year round. Ideal for filling and spectacular with soups. A delicious traditional roll from Kent, made with regionally sourced stone ground flour. This very rich bread has excellent keeping qualities and is perfect for filling for that extra special taste. The huffkin is one of the few proud survivors of Britain’s local baking traditions having been made by Kentish bakers for generations. The rich bread is made with stone-ground flour and requires slow proving to provide the soft crumb and crust. The indent in the middle was traditionally made by the baker’s thumb and naturally coming from the Garden of England would often be filed with pitted cherries though these days it is more commonly found with any savoury filling for a substantial and historic snack. Our rustic sourdough roll has a crunchy, crisp crust and a perfectly soft interior. With its mildly sour flavour and light, airy texture it can be enjoyed as a sandwich, burger bun or an accompaniment to meals. Brown sub loaves for sandwich bars & takeaways, 23" long for cutting and toasting. A tomato/olive ciabatta, gloriously yeasty with a crisp, floury crust and traditional open texture. It toasts beautifully and forms the perfect base for bruschetta. White sub loaves topped with sesame seeds, ideal for sandwich bars & takeaways, approx. 23” long for cutting and toasting. This versatile hand pulled ciabatta-style panini is equally at home served cold or from a traditional panini press. This medley of individual Mediterranean focaccia rolls are all hand-dipped in extra virgin rapeseed oil that has been infused with herbs to give a fragrant aroma and a deliciously crispy crust. Black olive with Italian oregano. This medley of individual Mediterranean focaccia rolls are all hand-dipped in extra virgin rapeseed oil that has been infused with herbs to give a fragrant aroma and a deliciously crispy crust. Sundried tomato with basil. Our large ciabatta roll is generously sized for sharing, the perfect accompaniment for Italian food as well as crisp salads, hearty soups and stews. All our ciabattas are made with a 24–48 hour fermented Rye sponge dough, individually hand-pulled and double fermented in the traditional way to ensure each ciabattas has the same amazing flavour, open texture and crust but each one still remains “an individual”. The way good bread should be. This medley of individual Mediterranean focaccia rolls are all hand-dipped in extra virgin rapeseed oil that has been infused with herbs to give a fragrant aroma and a deliciously crispy crust. Plain focaccia with rosemary. This round version of our popular ciabatta roll is the perfect shape and size for gourmet burgers. An authentic French country roll, hand-shaped with a rustic floured finish. Great for filling or served with soups. Made the old fashioned way under the guidelines of the Real Bread Campaign. Carries the authentic ‘Real Bread’ mark. Traditional English cottage loaf-shaped roll, topped with cracked wheat for a wonderfully nutty flavour. 2–3 minutes for a fresh and crusty roll. Traditional English cottage loaf-shaped roll, lightly floured and delicious tasting. Perfect for accompanying a ploughman’s platter. Made with the greatest care from the best ingredients, this versatile product provides an excellent base for many fillings. This authentic sourdough bread makes a delicious sandwich or is terrific as a gourmet burger bun for 6 or 8oz burgers.